Preheat your oven to 425 degrees F and line a large baking sheet with parchment paper. 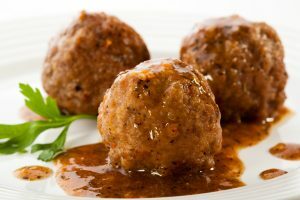 Bake meatballs (makes 18) on baking sheet at 425 for 15-18 minutes or until no longer pink on the inside, turning once midway. Meanwhile, melt the coconut oil or ghee in a large saucepan or stock pot over medium heat. Add the onions and cook until translucent and fragrant, then add the garlic and continue to cook for 2 minutes or until soft and fragrant. Lower the heat, then add the tomato sauce, pumpkin, broth, coconut milk, Italian seasoning, pumpkin pie spice, dried sage, dried rosemary and stir to combine well. Season with salt, black pepper or crushed red pepper, if desired. Stir to combine flavors, then cover and allow to simmer for 5 minutes prior to adding the meatballs. After adding meatballs, continue to simmer on low heat about 5 minutes prior to serving. Serve over your favorite veggie noodles- I love sweet potato noodles with these! **Blend your coconut milk to a smooth consistency before adding. If you prefer a slightly thinner sauce, use 1/4 cup coconut milk and 3/4 cup broth instead of 1/2 and 1/2. Original recipe from Paleo Running Momma can be found here! This pancake batter is made in the blender with Greek yogurt, sweet strawberries, and oats mixed with chunks of dark chocolate. Top them with fresh berries for a deliciously sweet and healthy breakfast! Heat a skillet to medium-high heat and spray with nonstick cooking spray. To a blender or food processor, add all ingredients and process until batter is smooth. It should be slightly runny. To the skillet, add 1/4 cup of batter at a time to form a pancake. Cook 3-4 minutes until pancake begins to bubble then flip with a spatula and cook another 2-3 minutes on the other side. 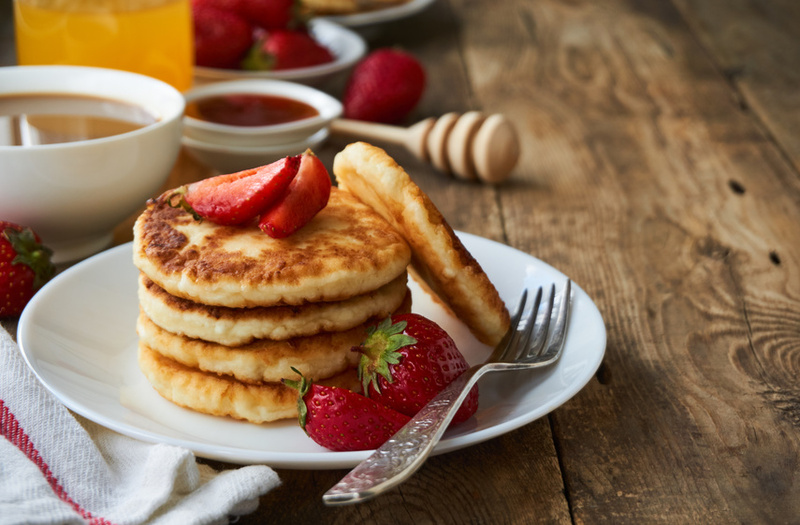 Place pancakes on a cooling rack as you cook remainder of the batter. Serve and top with more fresh berries and dark chocolate. Keep pancakes in an air tight container for up to a week. NOTES: It’s imperative that you measure properly when grain free baking. This recipe comes from a favorite cookbook titled Run Fast, Eat Slow. 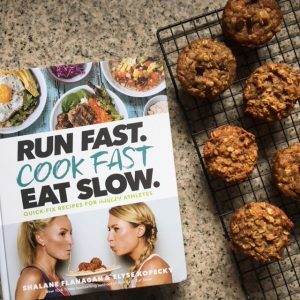 Authors Elyse Koepesky and Shalane Flanagan (winner of the 2017 NYC Marathon) are big fans of real foods that fuel your body and your workouts. They’re full of veggies and sweetened with maple syrup (instead of refined sugar). Perfect for an easy grab-n-run breakfast. “And don’t fear the butter.” Adding healthy fats to your meals is a great way to start your day and help keep you satisfied longer. As a bonus, these muffins are gluten-free. Original recipe from Run Fast, Eat Slow can be found here! This recipe comes from Cooking Without Recipes, where you learn how to make a delicious dish, but don’t worry too much about the nitty-gritty details of the recipe, so you can create your own spin! Fire up the grill! Peel down (but don’t remove) the husks from the corn and pull off any silk on the cob. Grill corn in husks, turning occasionally, until the cobs are a little charred and smoky, about 15 minutes. Remove the ears from the grill and let cool to room temperature. While the corn is cooling, halve a pint or two of cherry or grape tomatoes. If you’re working with smaller sweet tomatoes (I wouldn’t recommend using squishy heirlooms for this), quarter them. Once the corn has cooled, cut the kernels off the cob into a large bowl. Add the tomatoes and two cubed avocados, half-mashing the avocado into the rest of the mixture without making it too pasty. Mix in the leaves of about 5 sprigs of cilantro. Make a vinaigrette by combining 2 Tbsp. of lime zest, 2 Tbsp. of lemon zest, the juice of half a lime, the juice of half a lemon, and around 2 Tbsp. olive oil. 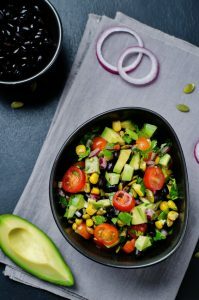 Drizzle over the top of the salad and fold it all together, seasoning with flaky salt, pepper, and the leaves of a few more sprigs of cilantro to taste. Bonus: If you’re making the salad in advance, grill the corn, chop the tomatoes, and make the vinaigrette ahead of time. Then just assemble (and cut into the avocado) when you’re ready! Original recipe from Bon Appetit can be found here!